In this week's Croatia travel tips we are sharing our tips for first-time travel to Croatia. Readers of our blog, often send us emails with questions regarding their upcoming, and often first-time, visit to Croatia. So we've decided to publish a post with some of the most common concerns, misconceptions, and general tips. Even if you've been in Croatia before, we hope you'll find some useful tips for your next vacation in Croatia. You can't visit the entire country in a week stay. No matter how small Croatia might seem, the country is long, and from Umag to the northwest to Dubrovnik to the southeast you'll need to cover 700 km. Besides, there are so many places to visit in Croatia, that you simply can't do it all in a week or two. If you still like to visit more than one place, stay somewhere central. And then do day trips from your base location. Split can be good base to visit Dalmatia (and Split is an awesome town to see!). From Split, you can easily reach the islands of Brac, Hvar, Korcula, and Vis, Trogir, Omis, Krka Waterfalls, and even Dubrovnik. Porec is a great base to visit Istria. It's centrally located to visit all highlights of Istria within an hour drive. And yet it's cheaper place to stay than Rovinj. If you don't travel by car already, then rent one at least for a day when in Croatia. Croatia is a perfect destination for a road trip. Roads are in great condition, and scenery is breath-taking. Our favourite road trips are along Adriatic coastal road from Split to Dubrovnik, along Peljesac peninsula, and around Istria. Here is our full post on Driving in Croatia, and Car Rental in Croatia. I would say that travelers to Croatia, after visiting a country for a brief time, leave it with the biggest misconception about food. No, along the coast, locals don't eat roasted pork. We'll all always rather have a roasted lamb. But hey, if Germans, our most numerous guests, love their roasted pork, then we are happy to prepare it for them. Many restaurants are also very touristy, and not particularly exciting. You know those places offering pasta, pizza, risotto, grilled meat, and a fish plate for two?! Advertised, for better understanding, with photos of the plates you'll get. Please, try to eat at least once at restaurants that locals love. Many readers of our blog, as well as our friends, when planing to visit Croatia for the first time, imagine themselves hopping from one island to another and visiting half dozen of them in less than a week. It's not going to happen. While islands are not far one from another geographically, they are far enough when it comes to an ease of transport. More often than not you'll need to choose a port city on the mainland for your base if you would like to visit more than one island during your short stay in Croatia. Sorry to disappoint you, but the only way to do it is renting a yacht, or hopping on those charter boats that sail along Adriatic. Zagreb is for many their entrance point to Croatia, yet majority of travelers either visit it for just a couple of hours, or skip it all together. Mistake! Zagreb is wonderful, and even more so in summer, when many locals leave town for the coast, traffic gets light, and lots of street performances take place all over the town. Put Zagreb on your Croatia travel itinerary! Check here all wonderful things to do in Zagreb, or read our post on best Zagreb accommodation. Croatians love shopping for the fresh produce at the open air green and fish markets. You'll find these markets in every town in Croatia. Feel the pulse of the town, and watch the locals go with their everyday habits, as you explore local green markets. We've written about Dolac, Zagreb's main green market, and Pazar, Split's green market. Plitvice is one of the most visited places in all Croatia, and the single most visited national park in Croatia. But, indeed, it's not the only beautiful national park in Croatia. Croatia's got them eight. If you don't like crowds, consider visiting Risnjak, North Velebit, or Paklenica National Parks. If you like to stick to waterfalls, try Krka Waterfalls instead. If you are curious about Croatian islands, why wouldn't you visit Kornati, Mljet, or Brijuni, all three national park themselves. Istria is the most visited region in Croatia. Yet it remains very little visited by overseas guests, like Australians, Americans, or Japanese. It sometimes seems to be Europe's best kept secret. Lots of Europeans, particularly Germans, Austrians, and Italians, spend their holidays in Istria. If it's your first-time travel to Croatia, consider visiting Istria. The region is gorgeous, full of history, culture, and a dream destination for any foodie. Unlike the rest of Europe, Croatian train network is really poor, and not really a viable way to explore the country. However, bus network is extensive, awesome and reliable. Forget trains, and look for buses instead. GetByBus does a great job of aggregating lots of bus lines within Croatia, and between Croatian towns and major European destinations. Even more, they offer online tickets for all those bus lines. Hell, no! Croatia has always been popular among European travelers. When you visit, especially during high season (July, August), and especially popular destinations like Plitvice, Dubrovnik, Split, Zadar, Istria, expect crowds, queues, traffic jams, and few (if any) solo moments for a selfie. Uber just started operating in Croatia few years ago, and so far it operates only in Zagreb and Split a year around. In other coastal towns, like Dubrovnik, Zadar, and Rovinj, Uber operates seasonally. Zagreb also has the most competitive and cheapest taxi scene in all Croatia. So, yes, if visiting Zagreb, go ahead and take a cab everywhere. As for the rest of Croatia, use it if it's your only transport option, or if you are two or more and can split a cost. Taxis are super expensive, and the drivers aren't always polite. No need to worry about not speaking Croatian. It's a difficult language to learn and Croatians know it. Almost everybody speaks at least a little English, and many people also speak at least another foreign language (German and/ or Italian being the most widely spoken languages after English). Tourism as we know it today started mass developing in Croatia in 60's. And today tourism is a main industry in Croatia (for better or worse). That said, expect to find an excellent tourist infrastructure all along the coastal Croatia: from amazing all-inclusive resorts, luxury & boutique hotels, budget hostels, to abundance of vacation rentals, villas, and campsites. Croatians have a long tradition of hosting vacationers from all over the world. Almost every family along the coast rent apartments to tourists. Vacation rentals are a great alternative to hotels, offer better value for money (especially for families, or large parties), come with fully-equipped kitchen, and offer more space. 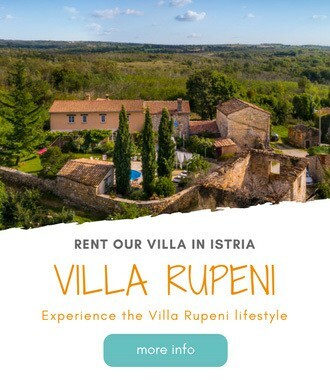 Check my in-laws vacation rentals in southern Dalmatia, and our villa rental near Porec. Or, read our full post on Croatia apartments to rent. People sometimes falsely assume that Croatia is cheap. Well, it's not. In fact many things, particularly groceries, are more expensive than in US or any Western European country. The only things I find cheap(er) in Croatia are wine, spirits, cigarettes, pastry shops, and dining out. For the rest, expect to spend as much as back home. Croatia is a small country, and whatever people here produce, they produce it in small quantities. All produce is also mostly sold to a Croatian market. This is the reason you've perhaps never heard of Croatian wine or olive oil. But let me reassure you, they are of an excellent quality, and must try when in Croatia. In fact we highly recommend you to go wine tasting or olive oil tasting. Our favourite white wine is Malvazija Istarska (check our post on 5 wineries to visit in Istria), and our favourite red is Dingac from Peljesac peninsula (especially Saints Hills). As for olive oil, I am absolutely crazy about this Croatian stuff. So much that from this year we even started making our own olive oil. We recommend visiting Chiavalon Olive Oil Estate in Vodnjan. Yep, it's true! Croatia is a member of EU, but not a member of Euro Zone (countries using Euro as a common currency). Croatian currency is Kuna, and the exchange rate (as per December 2018) is 7,4 Kn per 1 €, 6,5 Kn per 1 US$, and 8,3 Kn per 1 £. We strongly believe that one should always travel light, and bring as little things as possible when travelling. However, few things we highly recommend you to bring with you to Croatia are mosquito repellent (we like Repel’s Lemon & Eucalyptus), adapters, and water shoes for Croatian rocky beaches. Fodor's Croatia Travel Guide (we are co-authors!). We've got lots of good stuff here at our Croatia Travel Guide and Blog, stick around, read further, and let us know if we can help with anything regarding your travel to Croatia. We hope you've enjoyed our tips for first time travel to Croatia. Still have a question? Please leave them in the comments below. 1) Is power adapter that was used in Hungary good for Croatia? 2)What is best way/place to exchange U.S. dollars for Kuna? I don’t know how are electric outlets in Hungary. In Croatia we use round-pronged plugs, like on this photo: https://goo.gl/images/wnxTv4. There are many exchange offices in Croatia. They take no commission but check for the best exchange rate among them once you are here. Banks usually charge commission. Hi, Frank and Vara. We are Dan and Susan from La Mirada, California, USA. Susan found your blog, and we appreciate the loaded content about Croatia. Thanks for all the work you put into it. It’s been tremendously helpful. We will be visiting Croatia from May 13, 2019 through May 29, 2019. We are very excited about the trip. We are currently planning our itinerary, and this is where we were hoping you can provide some feedback. As you can see, we have an open day on 5/18. Should we stay another night in Rovinj and explore Motovun, or leave Rovinj and visit a different area? Also, we were planning on staying at Rastovaca when we visit Plitvice. What are your thoughts on this? Lastly, do you recommend we stay in Split for 3 days and explore Hvar and Brac as day trips? Or would it be better to stay at Hvar for two nights? We would appreciate any input and advice you may have about our itinerary. thanks for reaching out, and thanks for reading. Here are our thoughts, you can as well stay in Rovinj another day and visit Motovun, but also Groznjan, and perhaps Porec on the way back. You can plan a lunch in hinterland (our suggestions would be tavern Toncic, Buscina, Morgan, or Stari podrum). You can also visit a winery, perhaps Kozlovic, or Kabola. On the day that you visit Pula, plan a stop in Vodnjan at Chiavalon to taste some local olive oil. Plitvice, maybe you can depart for Zadar after the visit. It all depends how long you plan to hike in Plitvice. If you go for a 6 or 8 hour tour, then staying another night in Plitvice can be a good idea. Otherwise, you can probably go straight to Zadar. Use that extra day in Zadar to do an excursion to Kornati National Park. It’s beautiful! It’s easier to explore Brac from Split than Hvar. I am from australia and am going to have 3 days in dubrovnik before joining a group tour from Split tp Bled. Can you give me an idea what are the toll fees like on the large highways? We are coming to Croatia June , we can hardly wait. What a lovely, impressive sight! Can you tell me anything about festivals and markets that will take place in the fall? We will be traveling to Istria in late October, and wanted to know what source you use for finding local events. Thanks for your time and help! What would you recommend as a 10 days travel itinerary for Croatia in November?